I really like pens, pencils, and pretty much all the cool stationery, but I also like to keep things organized – so I have one bag which is dedicated to my artwork and stationery collection which has built up over the last 10 years or so. 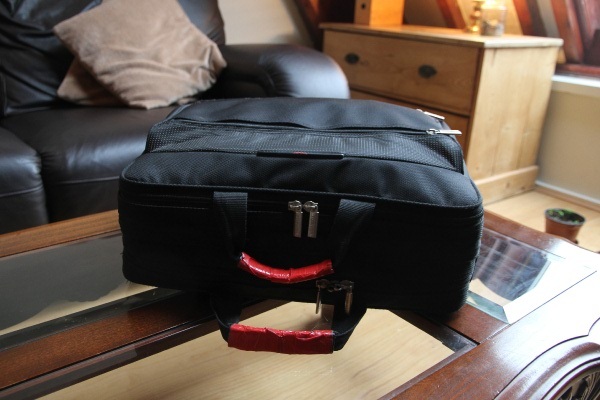 The bag itself is a Toshiba laptop bag, with lots of little organization pockets on both the inside and on the front, a section for papers and other things, and of course the main laptop compartment. Inside the bag I keep a number of pencil cases, some tear-out paper books, a folder of drawings, a couple of Moleskines and a Toshiba R400 Tablet PC. The Tablet PC lets me draw directly on the screen, which I mainly use for producing cartoon-like graphics (I should totally post some!) and any other photo retouching work. 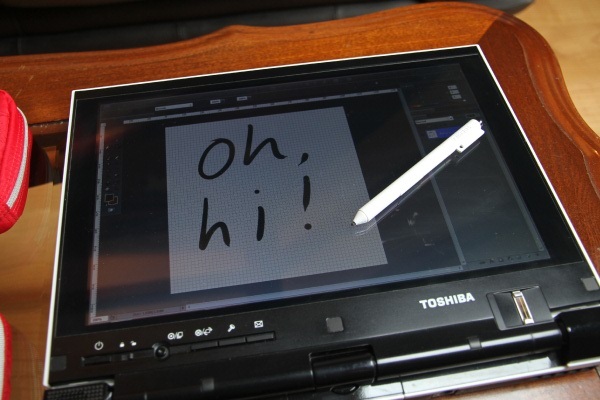 I’m actually really fond of the ink support in Windows 7 and I love using the Wacom ‘penabled’ digitizer to produce pressure sensitive lines. 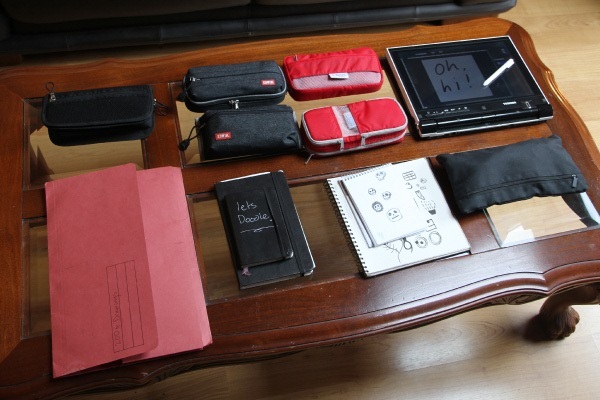 The black pencil case on the far left contains mostly pencils. There is a set of Watercolor pencils, a set of various grades of lead pencil, and some brushes for when I fancy mixing the colours. Pretty much everything in this pencil case is from WHSmiths. 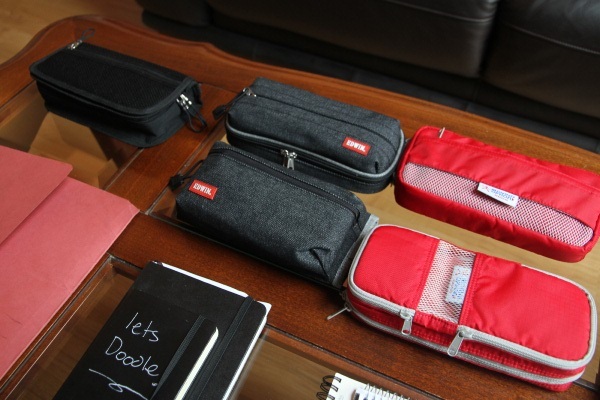 The two denim Edwin pencil cases contain a wide selection of pens, too many to go through in this post, but I’ll write a follow up on some of my favourites in the future. The larger of the two also contains some spares I’ve purchased – for example I have a couple of Sailor Ink Bar pens which are unfortunately no longer being produced. These pens are sourced from a number of places including Cult Pens and JetPens and random shops I’ve found in the UK. The two red Nomadic pencil cases are home to my favourite art pens, the supplies I usually need when doing any arts and crafts, and all the spare leads for the various pencils I use for drawing. I’ll definitely write a post about these two soon. 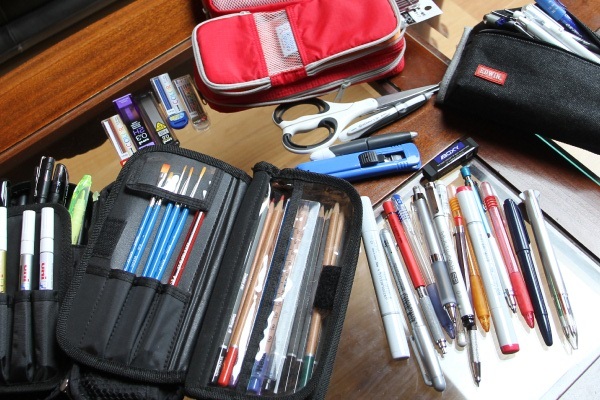 But that’s not even everything… you can also check out the contents of my favourite pen collection, and I’ll be sure to write some more posts in the future which will detail some of the most intersting pens, including why I like the Kuru Toga and Jetstream ranges so much. I know I have a bit of a pen addiction, but I’m not the only one. Brad Dowdy from The Pen Addict has set up an IRC channel on irc.freenode.net #penaddict. Feel free to drop by to our ‘help group’ with your IRC client of choice, or via your web browser. Yes you should post some! Amazing. Quite a brilliant idea. I know this post is old but I hope you can answer my question still. Where did you get that black color pencil on the far left that houses the color pencils and brushes? Is there a name I can search for? Thanks in advance… I’ve been looking for a pencil case just like that! I don’t think there is a name! I just had a look for you and I couldn’t even see a label to say where it was made. I got it years ago from a store in the UK called WHSmiths, which is where I got most of those wooden pencils and brushes from. It was essentially a ‘no name’ self branded pencil case if I remember correctly. I hope you find one – I still use mine and it’s perfect for that job.